This week we have a chat with Nic Watt, who doesn't need much of an introduction in Australia. Watt's the creative director of indie powerhouse, Nnooo, which Nintendo fans will be especially aware of; this is the outfit that created Pop (way back on the Wii), escapeVektor and, most recently, Blast 'Em Bunnies, the arcade throwback all about mowing down hordes of adorably evil bunnies using a watermelon gun and other such weapons. Nic W: I am working as a consultant on two projects at the moment as well as designing a new game with a super talented programmer. The two consultancy projects are for the Heart Foundation and the Office of eSafety (a part of the Australian Federal Government). The Heart Foundation project is to design an app which facilitates behaviour change in cardiovascular disease suffers; while the Office of eSafety project is to design a video game to encourage behaviour change regarding digital literacy by providing players an opportunity to role play, develop and practice skills in responsibility, empathy, resilience, critical thinking and respect. Both of these projects are super exciting to work on and allow me to bring not only my games design and development knowledge to new industries but also work with them to research and develop new strategies to tackle these problems. On the more personal side of things, as I mentioned, I am working with a super talented programmer on a passion project. We have been prototyping some great gameplay over the last year or two and slowly starting to build the game world out. It is super exciting but not really much more I can say at this stage. In addition to this I am working closely with Bruce and our publishing partners on all the great games we are hoping to bring to console over the next year or two. Nic W: I think it is getting more and more vibrant. I do feel that it is unfortunate that the regional and Federal governments are taking such a piecemeal approach to funding and support for the industry, particularly in the most populous state of NSW. It is almost as if some of them believe that one state should be good at this and another should be good at that. IE they almost seem afraid to compete and bring all the states upwards! 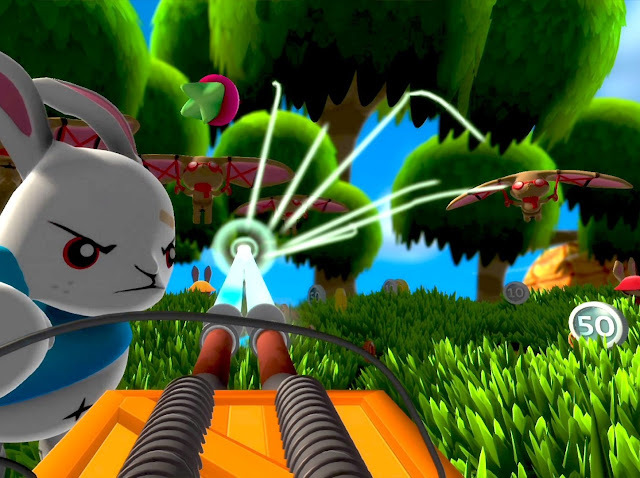 Related reading: Blast 'em Bunnies is seriously good fun. Here's our full review. If we could get some more people championing our cause across Australia and showcasing how skills from games development can translate across industries such as health or education people might start to understand that games are not such frivolous time-wasters but by bringing in funding and artistic support they can do much more to enrich our society than other artistic disciplines. Nic W: I am playing heaps of Overwatch and ARMS at the moment so I’d have to recommend them! Both of them are super fun games which are pretty easy to pick up, but hard to master. They also are amazing showcases for where the world is going in terms of connected, social, eSports. I have never been a big competitive gamer until Overwatch and now I am really enjoying being online, in voice chat, with great men and women from across the world! Nic W: I love how we are getting closer to the point where every key or lead character doesn’t have to be a white straight guy. Games like Horizon: Zero Dawn and Overwatch amongst others really show how you can make badass, exciting games which appeal to a wide range of people without falling on easy marketing excuses of “our lead character is a white male to appeal to the broadest number of people”. What I wish would change in games and in entertainment is to have some great gay male characters who have a deeper personality than the token camp/effeminate boy. Bioware used to lead the way in this, but I think they have dropped behind recently. As a gay man I’d like to start to have some role-models that are not what straight people think of us but what we can and want to be. Nic W: I’ve never played a game with Hatsune Miku in it... So erm... No?